My co-supervisor, Michael Weiss, came up with this diagram expressing the interactions we have with people on Twitter. Direct messaging is the most intimate form of communication, which we cannot track through the API without authentication (and then only for an individual user) as it is private. 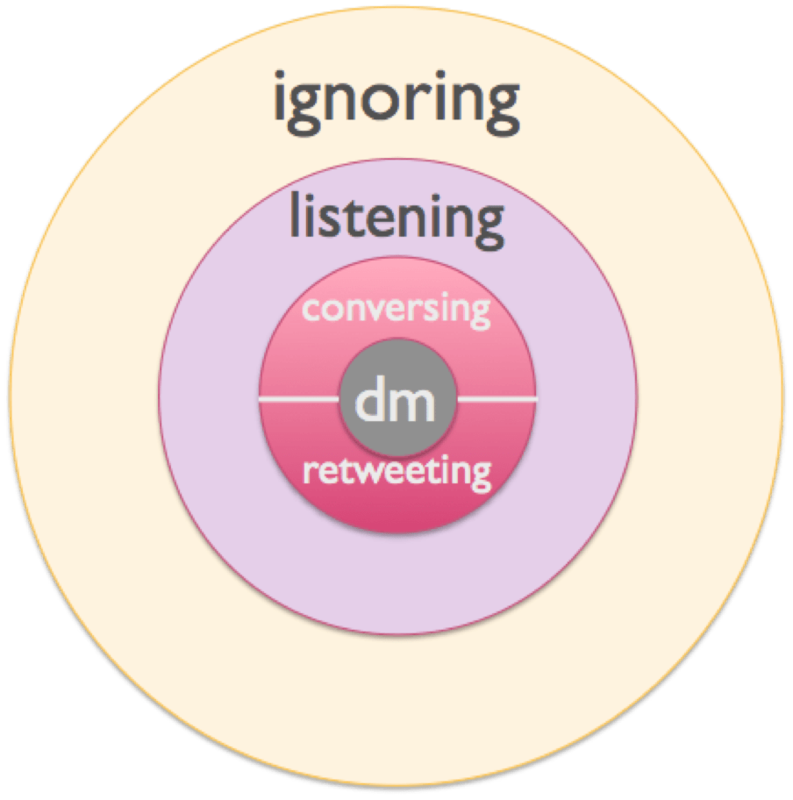 We have engagement through conversation and retweets, passive listening (also known as lurking) and ignoring. In reality, we probably move between these states over the course of our interactions, depending on how we use Twitter; sometimes communicating by direct message, sometimes retweeting or conversing publicly, sometimes passively consuming, and sometimes occupied elsewhere and not reading the stream. Only spammers, interesting only in pushing their content, will remain always at the outside – ignoring, not consuming other peoples’ content. which many countries utter desire to emulate. St., Eu Tong Sen St. etc etc. passport which becomes the gateway to migrate to any other country. below the standard of Singapore. They have their own country to fall back on. now. It is similar to the problems we are facing today. rise in population, are not solutions but only a remedial action. Singaporeans to â€œbring up our own next generationâ€ and grow their own families. a sense of belonging and identity. strengthen our team and help us and our children do betterâ€. is called upon to keep society open to immigrants. here at a time where there were no fruits to reap. status. It is time for the country to give it back to society and to our fathers. share the fruits of their success widely so that no Singaporeans are left out. success while it is still blooming, not the foreigners. order to find a solution in the near future. can only come up with medicinal remedies hoping to find a cure. us look back at the past. etc, etc during that hard times. He is absolutely right. even took the family with them. It has been a cost to the country. the fruits of their labor but it has come with a cost to the country. jobs, perhaps even better, but not able to do so. even get into university when the second language impedes them to get into the university. they will decide not to return. Again it is a lost to the country. Hanyu Pinyin was implemented in schools. generation. How did it help Singapore? not even get to see it at all. ends meet, these people accept the lower wages. upon by the very people who came here to reap the fruits of their labor. belonging to this country called Singapore. races in the near future. This becomes a problem for the country. motherland and making imported citizens better than Singaporeans. after the country and its citizens. It is never too late. Scheme for all Singpaore Citizens who are 60years and above. till 2030 when the aged population will reach 900,000 according to a survey. pension benchmark can be fixed with the economic growth of the country. or not to work. If they work it is an additional income. remain active and not living hand to mouth. and brought up the Singaporean way of living. which will be in good hands than the maid. peace of mind when they go back to the workforce to help the economy. taxpayers’ money to imported citizens who give birth to children in Singapore. They are here to reap the fruits of our forefathers. give pension that will benefit Singaporeans. to school saving transport cost. and perhaps a car too. They could even send their children to work. there will be $4800 dollars income for each household. because there will be more spending power and shops will benefit from this. serve and fight for the country. will be happy that the country is now looking after them. life was given for a worthy cause. can be better looked after in the old age homes with this income. to go some day and the children will have a bigger house for themselves. houses. It can be given to foreigners to stay. are holding the CPF till they die. welfare of our senior citizens at least we too can compromise on some disputes. FTs are not doing NS. are depleting their scarce resources like water, electricity and land space. housing prices, food prices, road congestion, Crime rate, COE, ERP, etc,etc. FTâ€™s are taking away their jobs. foreign students are here soliciting with a student visa. infrastructure across the board because of the increase in the population. to the success. They are here to reap the fruits. 52)Â Â Â Â Â Â All imported citizens shall be called IC. and contributing back to society. university at least the parents pension may help them to study overseas. this benefit unless they are here for more than 30 years. tax payers money is used to give scholarship to foreign students. all they have contributed to the nation, with this pension scheme. in the house and/or to the children. At least they have an income of their own. CPF money is their hard earn money which should not be included. use of HDB houses to their advantage. scheme is not applicable to imported citizens of 30 years or less. increase in prices on utilities and public transport. two casinos as they are NOT contributing back to society. can have a floating population of 0.5 million of unskilled workers. led to the losses thereby affecting the consumers. coverage as their income will be sufficient to pay for the premium. available for other more important things. companies, makes yearly profit except for a few which comes from the coffer. citizens do not have too much excess income. long term especially growing up without a father. from the decision that we make today. years. They cannot impose their way of living and moral values on our society. the question is where do we get the money to pay for the pension scheme ????????? is the money coming from? contribute back to society to the people that made it happen. country if not more. All foreigners are here to benefit from the countryâ€™s prosperity. this fund. This again within the ambit of foreigners. 36% of their salary cut which shall be transferred to this fund. a month. You can provide more than 100,000 people above 60yrs with this money. smoking. So give the money back to society. the COE and ERP every month is not taken into consideration. reserve need not be utilized at all. It can remain where it is. appropriately addressed with this proposal. now. This is the truth but sometimes the TRUTH is hard to swallow. political will to do it when the country is still progressing?